Since its revolution in 2003 outing the Soviet government, Tbilisi has come a long way. The city has transformed itself into a cosmopolitan hot spot overflowing with a mix of old meets new that is waiting to be explored. After discovering Georgia offers South Africans a one-year free visa, I ended up spending almost two months exploring the country. But I kept coming back to Tbilisi and fell in love with its winding lanes, beautiful architecture and the rich history that gives the city its unique charm. Here’s my ultimate Tbilisi, Georgia travel guide! I flew in from Izmir, Turkey to Tbilisi. The flight takes about two hours and depending on when you book, costs less than a domestic flight between Johannesburg and Cape Town. The cheap flights will mean that you’ll fly in late, arriving at 2:00 a.m. But most hostels and hotels provide a taxi transfer giving you an easy way to get to your final destination without haggling. But if you arrive during the day, the cheapest way to get from the airport into the city is on the metro or the local bus. Getting around Tbilisi and the surrounding areas is cheap, easy and safe. But if you’re unsure about how to get somewhere, head to the tourist information office in Freedom Square. All the staff speak English and will happily explain which bus to catch from what station to get to your final destination. They will also give you a map and provide other information such as costs and departure times. 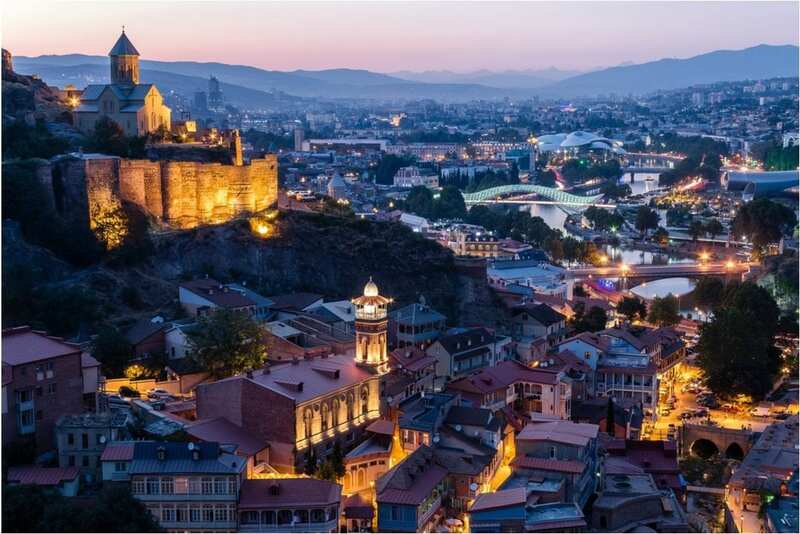 Tbilisi is a city you can easily explore on foot. Not only is it safe, but most sights aren’t too far from each other, and you’ll discover plenty more in between. Travelling by metro was my favourite way to get around Tbilisi. Tickets only cost GEL 0.50c (R 2.60) each way and the trains were fast, reliable and clean. While I tend to avoid taxi drivers like the bubonic plague when abroad, that didn’t happen in Tbilisi. Whether I hailed them from the street or used their Uber-like app, the drivers were always friendly and helpful even with the language barrier. Rides around the city aren’t expensive and will only set you back a couple of GEL. But if you are going to the airport expect to pay GEL 20 (R105.00) one way. One of the cheapest ways to travel long distance in Georgia is with the marshrutkas. Instead of forking out for organised tours, I went by myself to places like Kazbeki, Telavi, Signagi and Armenia. It cost me so much less, and I had more chances to interact with the locals. In Tbilisi, you’ll also find buses that you can take to get around town. These are also super affordable and come with free onboard Wi-Fi. The best place to stay in Tbilisi is in the old neighbourhoods. You’ll find a more authentic vibe and loads of little streets to explore during the day. There are also tons of accommodation options to suit the frugal backpacker or those looking to splurge. Namaste Hostel: I spent the majority of my two months in the region staying at Namaste Hostel. In part, it was because my bag along with my passport was stolen, but I also had the best time there. It is more expensive than the dirt cheap hostels you’ll find around the city, but you’ll have some of the best views, free coffee and a vibe that will more than make up for it. Ateshgah Residence: For those looking for something different, Ateshgah is a detached holiday home in the heart of Tbilisi. It’s the perfect spot in the city for travellers who want more privacy and something different from the typical hotel experience. But it’s one of the city’s most popular boutique accommodations and commands R 3000 per night. 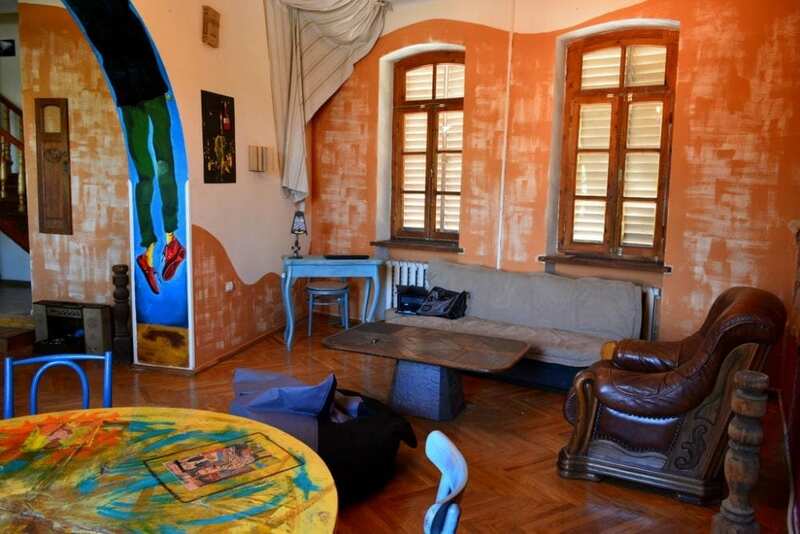 Artists Residence: If you want some luxury without a hefty price tag, Artists Residence is an incredible Tbilisi hotel. It’s a place where art and design meet, transforming an ordinary townhouse into an experience. TiflisLux Boutique Guest House: If you’re on a budget, but over staying at hostels, TiflisLux is a great compromise for your wallet. The rooms are beautifully decorated with views of the city or the Mtatsminda Mountain. The best part? It’s only R 450.00 a room for two people! Vegans will have a hard time finding a bite to eat at restaurants around the country. Luckily, there are a few spots in the city that have started to cater for a plant-based diet. But cooking your own food will become your only option once you move outside of the capital. Unless you’re okay with eating the same three vegan-friendly local dishes over and over. Cafe Leila is located in Old Tbilisi right by the famous clock tower. It’s a great place to people watch, and it’s filled with unique decor that adds to its romantic ambiance. But for vegans, it’s a little oasis. You’ll find more variety to choose from than other spots around town, and while the prices are expensive, the quality of food is top notch. I highly recommend the pumpkin soup! If you want to try some local Georgian food as a vegan – head to Machakhela. It’s a popular restaurant chain in the country, and you’ll find many dotted around Tbilisi. 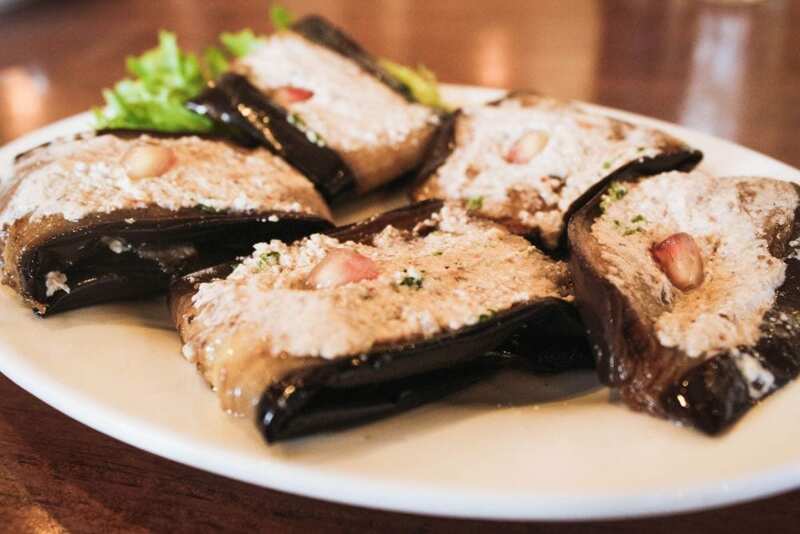 For starters, try the eggplant with walnut sauce. It is served cold (for some strange reason), and while I liked it, I do think it would taste better warmed up. For mains, you can try the lobio. It’s beans served in a clay pot and is delicious. Otherwise, there is the khachapuri. While this dish is traditionally made with loads of cheese and a raw egg in the middle, Machakhela has a few variations. I tried the one that came with a stew of vegetables inside sans any animal products. But I’m not sure if the dough was 100% vegan. There was a bit of a language barrier, so double check before ordering. Menu G is Tbilisi’s answer to Uber Eats. There were a few times where I wasn’t in the mood for the whole restaurant vibe or cooking, and this app saved my day. I had some delicious veggie burgers and falafels from restaurants around the city and recommend using it even if it’s just to get some mealtime inspiration. Whether you stay in Old Tbilisi or the more modern parts, there are tons to do around the city. But most of Georgia’s charm does lie in its natural beauty and smaller towns scattered across the country. Depending on your travelling style and interests, you’ll only need two to three days to explore this capital city. Visit the Holy Trinity Cathedral of Tbilisi at sunrise. It’s one of the largest religious buildings in the world and worth the visit – even if you aren’t religious. One of the best times to visit is at sunrise for zero crowds and the perfect morning light. Plus, if you get there early you can also avoid getting hassled by the gipsies. Watch the sunset at the top of the ancient Narikala fortress. But don’t go up alone. Bring a bottle of wine (or a friend or two) to keep you company for a beautiful sundowner overlooking the city. Learn about Georgia’s history at the National Georgian Museum. If you’re a nerd like me, you’ll enjoy a trip to this museum. It’s filled with an ancient hominid skull collection as well as other artefacts from the first humans that roamed the country’s plains. Upstairs, you can learn more about Georgia’s recent history such as its Soviet occupation. Go on a day trip. One of the best parts about Tbilisi is that it’s only a few hours from beautiful sights across the country. 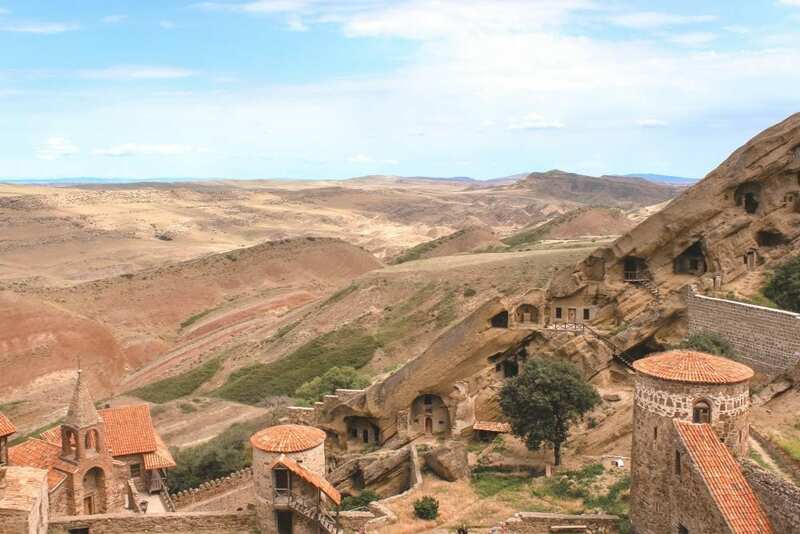 I went on a day trip to David Gareja, a monastery complex built into the rock on the half-desert slopes of Mount Gareja. I also went on a wine tour around Telavi, and there are many more places to choose from. Get lost exploring the cobbled streets. I don’t know about you, but my sense of direction is only activated once I’ve either walked or driven through a place a few times. As I don’t drive when I travel abroad, I go out of my way to explore a place on foot. Tbilisi is filled with old winding alleyways with buildings that have stood the test of time. Be sure to keep an eye out for the intricate designs on doors as you walk past! Indulge in some wine tasting. Georgia is the birthplace of wine. For real, it’s the oldest wine region in the world and is home to a UNESCO winemaking method. Wander into any of the wine shops in Tbilisi and the owners will be more than happy to offer you a free wine tasting. Be prepared for a few shots of cha cha (Georgian vodka) in between. Explore the nightlife. Tbilisi comes alive once the sun goes down. Whether you’re looking for a spot for a drink or want to experience the clubbing scene, you won’t find a shortage of options. One of my favourite bars was the Drunk Owl. I found it to be more of a local watering hole with excellent cocktails and taste in music. Languages: Georgian, Russian, and English. Cash: You can withdraw USD and the local currency at any Visa or Mastercard ATMs. While most places accept card, cash is still the preferred payment method. WiFi/Data: You can buy a SIM card at the airport and load it up with data. But Tbilisi has free public WiFi in most places and on public transport like the buses. Fireworks: Georgians love fireworks. A LOT. So much so that they celebrate anything and everything with a short firework display every single night. Yip. You can expect crackers to go off anytime in the evening – even as late as 2 am. 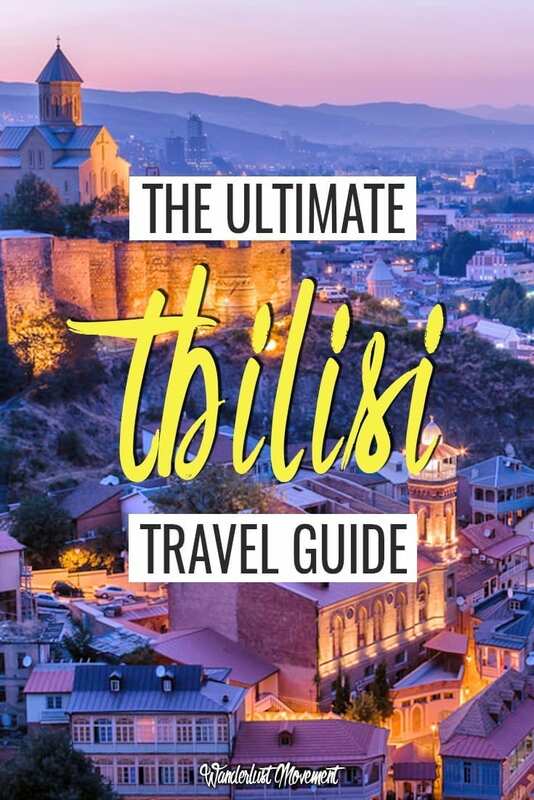 Do you have any tips for visiting Tbilisi, Georgia? Sound off in the comments below! Thanks for the guide and the vegan places! Thanks for the tips. I am visiting Georgia next week and shall bookmark this page!